Mammoth white titans rest on shoulders of the earth. Like ancient ghosts, they rise up and disappear into the dry land east of the Sierra Nevadas. 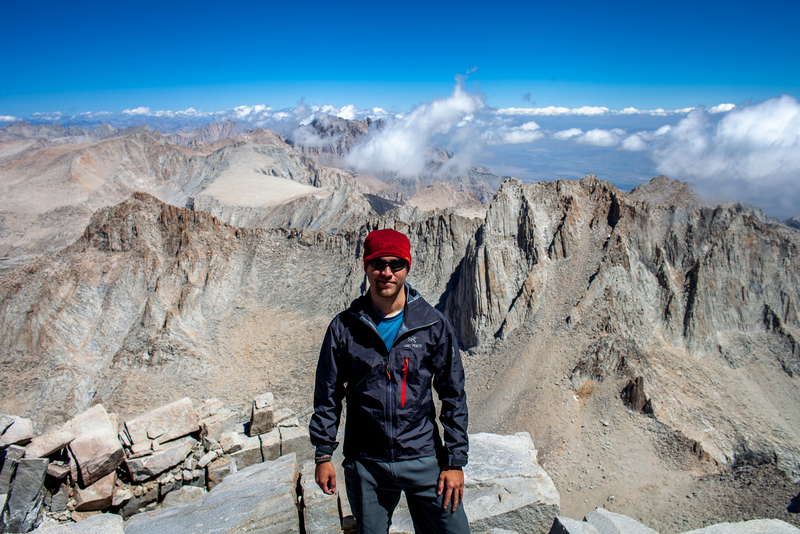 The peak of Mount Whitney stands before us, though I can’t decide if it’s a friend or enemy. It calls regardless. This is the short acclimation process our group of eight is going through before our planned ascent to the summit. We’ve arrived several days before and are taking day hikes up to prep ourselves for even thinner air at the top. I can’t help but search the sky ahead for signs of the coming trek. 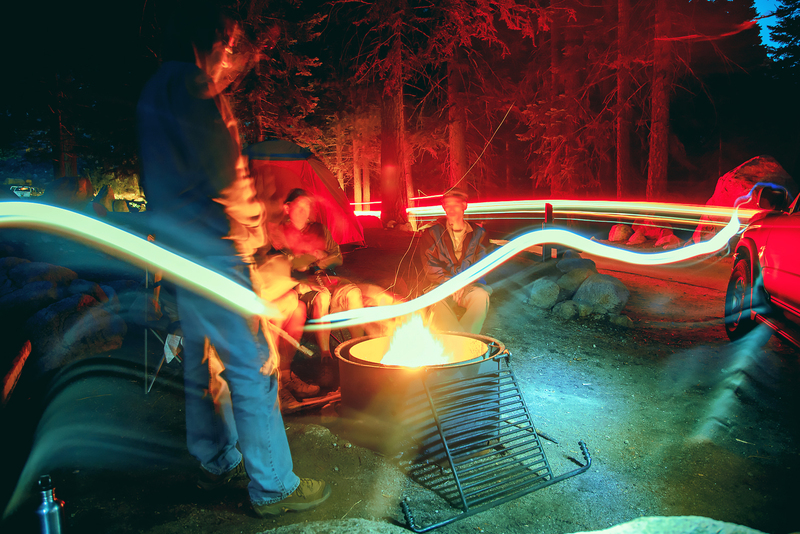 At night, we sit around the campfire and discuss details and questions that flurry our minds. Luckily, one among our eight has done this before, so we have some idea of what to expect, though knowing certain details only calms lightly. The thing I know for certain is my next night of sleep is going to be rough and restless. The night crawls on. 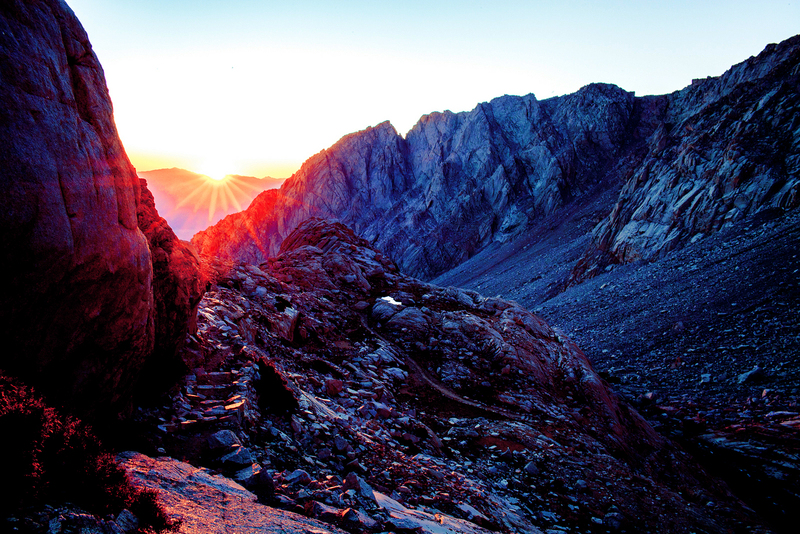 It’s 2 a.m. and I find myself at the gaping maw that leads up to Mount Whitney’s summit. The rock convergence that is this portion of the Eastern Sierra Nevada winds up and away. The twinkling Milky Way above, our group of eight speeds towards her peak. It will be at least eight hours, ten miles and six thousand feet of ascent before we reach the summit, but for now, I am relaxed and in awe of my surroundings. The darkness is our friend; it shrouds the goal ahead from view, keeping it from nagging at our minds. Hiking in a group like this at night is an odd passage through space and time. You can’t see where you’re going, and barely where you’ve come from, but what you can sense is the passing wilderness. The sounds of stomping feet, swollen lungs, waterfalls, and few birds accompany your mind’s game. Thinking becomes entertainment as oxygen becomes scarce and talking burns much of it. 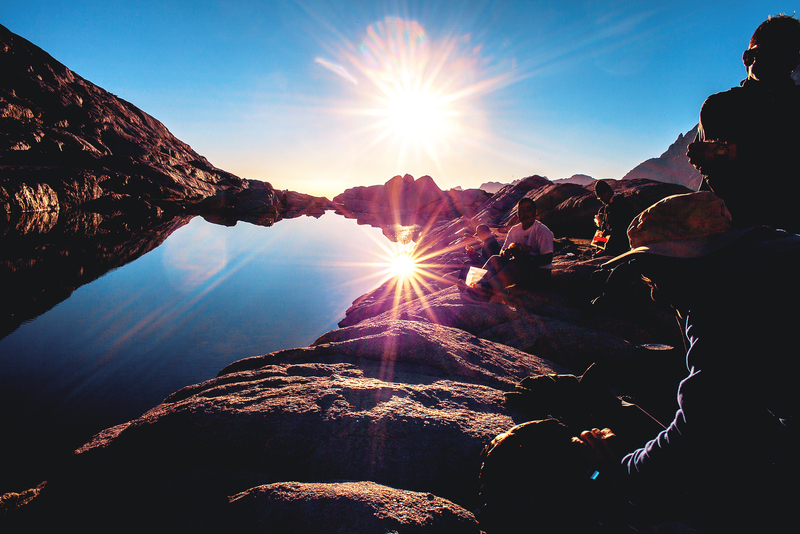 After many streams and lakes, groves of alpine forest and clearings, the group sees first light and our energy is renewed. It feels like a re-birth. We’re now past the timberline and dawn oozes onto the dramatic rock. I keep thinking how I’ve never seen landscapes like this, and each time I do, something new pops into view. Funny how mountains becomes stepping stones once you realize the scale of yourself… Hard granite steps snake up towards the first real rest near Consultation Lake and Trail Camp. I cannot wait to take my pack off and breath a bit easier. After Trail Camp, the hard part begins. Most anything I knew about monotony in hiking was naivety before this. 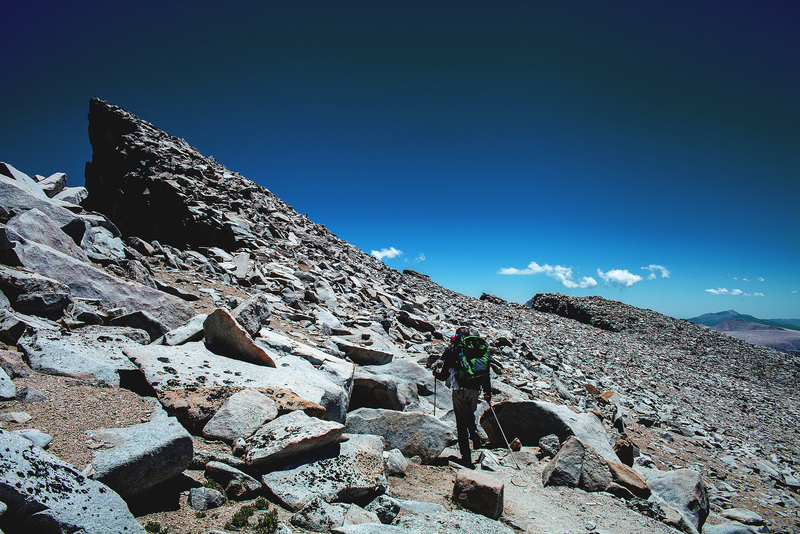 Mount Whitney’s infamous 99 switchbacks are a series of tedious and long back and forths to reach Trail Crest, where Whitney Trail meets the John Muir Trail. Here, through-hikers drop their large packs to hit the summit and descend again. It is at this point that one might realize just how much oxygen is taken for granted. A scant 1.9 miles to the top, I am hardly walking faster than a turtle. I take my time and at that it seems forever. The summit seems close, but it is still a distant white fleck. My mind wanders, numbingly so. The view from Trail Crest and hikers taking a much needed rest. Trail Camp is seen below and right near Consultation Lake. With little to think about, I breathe steadily and take in the landscape. Huge fields of boulder stretch as far as I can see ahead. To my left, a sheer drop-off, to my right is the mountain, with windows to the eastern deserts. I take many breaks and less pictures. It is here that I struggle most. Time passes slowly and breaths are short. Thanks much! I’m glad you enjoyed it.